This week’s Movies You Have Not Seen But Should will have you coming back over and over again. Welcome back to “Movies You Have Not Have Seen….But Should”. 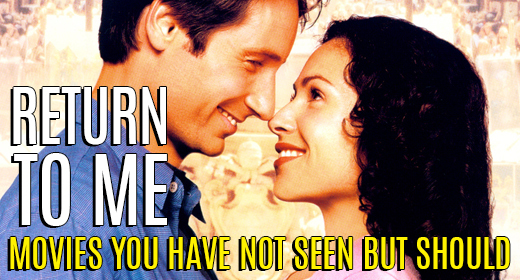 This week we will look at the 2000 romantic comedy Return to Me. This film stars include David Duchovny, Joely Richardson, Minnie Driver, Carroll O’ Conner, Bonnie Hunt, Jim Belushi & David Alan Grier. The film takes place in Chicago. Bob and Elizabeth Rueland (played by Duchovny & Richardson) both are at work at the Lincoln Park Zoo. Elizabeth is a zoologist whose focus is apes & Bob is an architect (and contractor) who has been commissioned to build a sanctuary for the apes at the zoo. It has been a project years in the making and is the life’s work of Elizabeth. As they are coming home from celebrating the raising of the full amount of the project, the Ruelands are involved in a car accident and Elizabeth dies. At the same time, Grace Briggs is in desperate need for a heart transplant. She has suffered from a heart condition since she was a teen and is near death. A heart finally comes in and she has the surgery to receive the heart. A year then passes. Bob has poured his life into getting the ape sanctuary finished in memory of his wife. His friend Charlie (played by Grier), who was a colleague of Elizabeth at the zoo, tries to set Bob up on a blind date and Bob begrudgingly agrees to go with Charlie and his date. On this date, the two couples meet at the restaurant. The date for Bob goes horribly but in passing meets Grace. As Bob leaves, he forgets his cell phone and has to come back. He ends up speaking to Marty O’Reilly (played by O’Conner), the owner of the restaurant and Grace’s grandfather. This in turn leads to Bob reconnecting with Grace along with meeting Marty’s friends along with Grace’s friends Joe and Megan (played by Belushi & Hunt). Sparks fly and Bob and Grace begin dating. However, Grace carries a secret. She knows that she got her heart from Elizabeth. Does she tell Bob? How will he react? You’ll have to watch and find out. Along with having a role in the film, Bonnie Hunt also co-wrote and directed the film. She used several actors and actresses (including Duchovny, Grier) that also had roles on her TV series Life with Bonnie. The film’s title is taken from an old 1957 Dean Martin song, which is used during the opening credits and a newer version of the song is used at the end. It was to be the last film of Carroll O’Conner’s career. He passed away a year after the film’s release. The film itself was released on April 7, 2000. It made $7.8 million its opening weekend and would go on to gross $36 million dollars at the box office. Return to Me is available on DVD, Amazon Instant Video and Netflix Instant Streaming. This film is a great example of a romantic comedy that works. If you’re in the mood for one, this is one to check out. It may be one that you may not have seen, but you should. I LOVE Return to Me. I have only ever purchased two or three romantic comedies, and that’s one of them. I randomly sing the first line of the song, and have for years. Michael Burgett is always pretty spot on with his articles. It’s very cheesy and predictable, but it’s not trying to be anything but that. I think that’s what makes it work so well (that and really good acting). @AskJustUsGeeks @JustUsGeeks I truly love that movie so good. Cindy Yager Arnold liked this on Facebook. Jennifer Lockhart liked this on Facebook. Nichole Kowalski liked this on Facebook.